Heinävesi is a municipality of Finland.It is located in the province of Eastern Finland and is part of the Southern Savonia region. 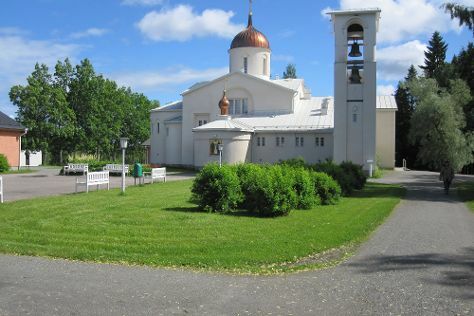 Start off your visit on the 25th (Thu): enjoy breathtaking views from Varkaus Water Tower Terrace, then see the interesting displays at Mekaanisen Musiikin Museo, then take in the spiritual surroundings of New Valamo Monastery, and finally pause for some serene contemplation at Heinaveden kirkko. On the 26th (Fri), you'll have a packed day of sightseeing: get answers to all your questions at Riihisaari, make a trip to Lintula Convent, then take in the spiritual surroundings of Leppavirta Church, and finally take in breathtaking views at Orinoro Gorge. To find photos, other places to visit, more things to do, and more tourist information, go to the Heinavesi trip planner . Expect a daytime high around 7°C in October, and nighttime lows around 0°C. Finish your sightseeing early on the 26th (Fri) so you can travel back home.